Caption: "What is the meaning of this in the Washington shop windows, and so near Christmas? Speak, and let worst be known." As tempers flared over the uncertain outcome of the presidential election, President Ulysses S. Grant ordered General William T. Sherman to reroute four artillery companies to the nation’s capital, where they were to maintain order. At first, however, the reason for the move was not make public, provoking cartoonist Thomas Nast to inquire why the soldiers were in Washington. Perhaps because Grant was his hero, Nast asks the question amid the innocent imagery of Christmas shopping and toy soldiers. 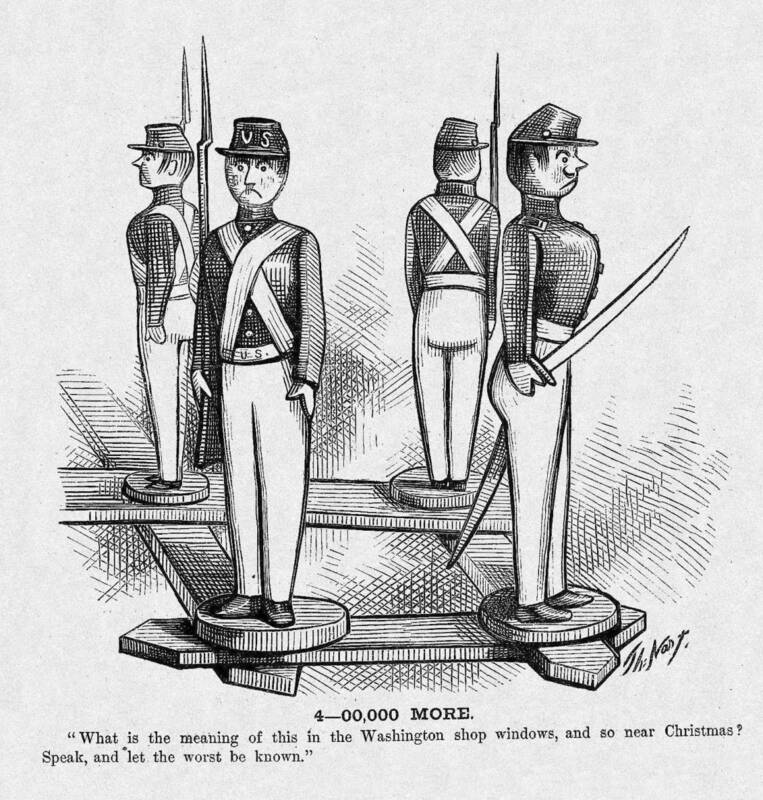 The title of the cartoon, however, mimics the refrain of a Civil War song, “We are coming, Father Abraham, 300,000 more.” It was written in response to President Abraham Lincoln’s request in July 1862 for additional volunteers for the Union army. In the early days of the Electoral College controversy there was fear that another civil war might start.